Ask fellow campers about "Sou'Wester Lodge" and nearby attractions. If you are into kitsch, this might be a place for you. If you are an RVer, you bring your own. We did. The roads are very narrow, you have to position yourself just right to make some of the turns. All but one of the spots are back in, and with only a car-width lane to back in from, it's very difficult if you have a long trailer. Bring more than 25 feet of water hose and sewer line if you expect to hook up. There are 2 rows of back in spots, and all the connections run down the middle. We barely made the water, but didn't bring enough sewer line to hook up. Our spot barely had enough room to run out the canopy, and it was flapping against the trailer in the next spot. They need to have the garbage emptied more often than they are, the container was full, and everyone was leaving their full bags on the ground in front of it. No fires allowed, no picnic tables provided, as there's no room for them. We camped at Sou'Wester Lodge in a Travel Trailer. 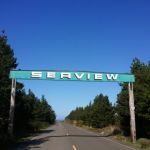 This is not just an RV park it is an experience! It has the usual hookups Wi-Fi clean restrooms. There is also a sauna a pavilion for great parties an awesome Lodge that was built in 1892 and is awesome to just explore! It is 1 block from the beach,you listen to the waves rolling in at night.Awesome walking paths,dog friendly,across the street from the Depot Restaurant ( best restaurant on the peninsula)Free concerts and entertainment on Sat nites. Staff is wonderful...which includes a massuse..how many rv,cabin and lodges offer that ?? A true oasis! We camped at Sou'Wester Lodge in a Motorhome. Potentially an 8 or 9, very friendly, helpful staff. 1892 Lodge w/four suites in converted upstairs Ballroom area unique as are all the various trailers for rent on daily/weekly basis, all items for sale in Lodge fairly priced on honor system. Rules posted for pets on leash and pickup poorly enforced and not adequate for 'responsible' pet owners. Shrubs and trees are in dire need of pruning and thinning to assist w/new growth and protection of RV campsite areas. Mostly paved access roadways and mostly grassy areas for campsites w/nice central fireplace area for nighttime fire and central kitchen for both RVers use and guests staying in unique vintage trailers. A must-see if passing through the area. Electrical service in RV area in dire need of updating as power surges and fluctuates with outages experienced. We had to pick up likely 3 dozen cigarette butts plus discarded peanut hulls in/around our campsite immediately upon check-in; some TLC would yield huge attractiveness; within walking distance of beaches and fine dining next door; excellent meals @ The Depot. We camped at Sou'Wester Lodge in a Motorhome. Stayed here over Labor Day, it was crowded but a pleasant crowded, not crammed in crowded. Owner and staff are friendly, out and about working everyday. Wi-Fi was slow in early evening but strong in am. Beach is within walking distance. An Izuzu Right hand drive mini parked next to us. The door faced our door. I couldn't figure out why door was on the left side of the unit then I realized it was right-hand drive and imported from Japan. The Canadian owners were friendly. Best spot is #42. Lots of vintage trailers to rent here, resident artists, music in the lodge. A neat place. 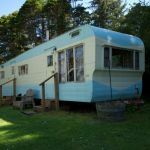 We camped at Sou'Wester Lodge in a Travel Trailer. Short drive to the beach. Quaint combination of vintage lodge, cottages, trailers, and RV park. 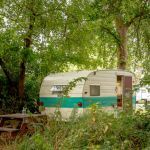 If you love vintage trailers, you will appreciate the assortment. Interesting old resort town with lots of lovely homes and right next to Long Beach. Grass sites. Not too reliable electricity for big rig. Good we have surge protector. Very casual type of place. We spent 4 days here. Enjoyed driving 4wheel on the beach and letting dog run on beach. We camped at Sou'Wester Lodge in a Motorhome. 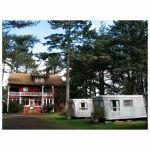 The Sou’Wester Resort is a historic lodge and vintage RV park on the Long Beach Peninsula about 15 miles North of the Columbia River. The history of the property dates back to 1892 when the first vacation cabins were built. It is now a collection of rustic cabins, vintage travel trailers and RV sites. The location is a block off the highway and quiet. RV sites are on and around a grass area surrounded by mature trees, and have full hookups. Sites vary in size, the larger ones being approximately 50 feet long and 20 feet wide. All are back-ins but some can be configured as pull-throughs when the park is not full. Most sites do not have fire pits or tables but there a large community recreation building and fire ring. There is no cable TV but most sites have satellite TV access. There is free Wi-Fi, but it is slow to the point of being almost unusable at times. Our Verizon MiFi worked but was also slow. The beach is less than a mile down a paved road, and there are two good restaurants within easy walking distance. A small fleet of loaner bicycles is available. We enjoyed our stay and will go back. We camped at Sou'Wester Lodge in a Motorhome. When they say rustic they mean it. This place is old and they are proud of it. Sites were fine but very sterile. We were the only guests in the RV park and that made it seem spacious. In high season I would imagine this to be cramped. Nice staff. They have cool old travel trailers permanently parked for rent as well. Reasonably close to the beach. The women liked it and the men thought it was over priced and run down. We camped at Sou'Wester Lodge in a Motorhome. Are you affiliated with Sou'Wester Lodge ?